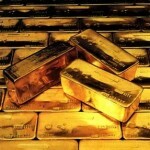 Los Angeles – The price of gold ended with a loss of 0.3% for the day on Friday, down just 0.4% for the week. Silver ended Friday with a loss of 0.2% at $19.91, down just 0.2% for the week. Analysts reported that any pullbacks in gold bullion prices would likely be temporary with gold eventually returning to its record highs. The week started slowly with very low trading volume due to the U.S. Labor Day holiday. The Jewish holiday of Rosh Hashanah, which began at sundown on Wednesday and ended at sundown Friday, kept volume light throughout the week and helped to benefit gold bullion prices. Gold bullion continues to be investors’ best bet with the price of gold gaining almost 400% in eleven years – that’s 16% per year. The U.S. dollar and the Dow have both declined 80% in value against gold since 1999. Frank Holmes, CEO of U.S. Global Investors, says gold has the potential to double within the next five years. Ashraf Laidi, chief foreign currency strategist at CMC Markets, says that “The case for metals remains not that of outright inflation but that of central banks’ prolonged liquidity drives. Currencies will gain/fall versus one another, but fresh asset purchases will maintain gold and silver ahead.” Laidi went further and forecasted a gold price of $1,330 before the end of 2010. Stephen Moore, economist and editorial board member at The Wall Street Journal, says the price of gold could reach $2,000 an ounce due to rising inflation and interest rate hikes. Moore’s target represents a rise of around 59% from gold’s current price levels. “Any savvy investor should hold gold in their portfolio. It’s the best hedge against inflation,” said Moore. Gold bullion prices moved slightly lower after initial jobless claims came in lower than expected and the trade gap narrowed. The week’s upcoming important economic reports include: Treasury Budget on Monday; Business Inventories and Retail Sales figures on Tuesday; the NY Fed Manufacturing Survey, Import and Export Prices, Industrial Production, and Capacity Utilization on Wednesday; Initial Jobless Claims, PPI, and the Philly Fed on Thursday; and CPI and Michigan Sentiment on Friday.